The National Football League took in $13 billion in revenue in 2016, nearly three times as much as the NBA and 37 percent more than Major League Baseball. The NFL’s commissioner and chief negotiator, Roger Goodell, the guy reviled by Tom Brady and network television CEOs alike, made a salary of nearly $32 million in 2015, not including his massive expense account. With the big money dangling like a gold ring on a carousel, you would think nothing could stop kids from wanting to reach for that ring. Nothing except Mom and the American Academy of Pediatrics, who want to prevent children from getting head injuries. Concussions have come out of the shadows of X-rays and into the light of functional MRIs and PET scans, where the damage from repeated head trauma can be traced. Parents realize that no amount of money can stop the shaking from Parkinson’s disease or cure Alzheimer’s and related cognitive disorders that can result from multiple concussions. If a lot of kids stop playing high school football, college scouts may not get the players they need to fill the open slots left by the last graduating class. College football is not just the farm team for the NFL, it’s the BMOC (Big Money On Campus), supporting huge salaries for coaches like Alabama’s Nick Saban, who earned nearly $7 million last year. And so it makes perfect sense that a school like the University of Alabama would tackle the head injury problem by helping to design a new helmet. 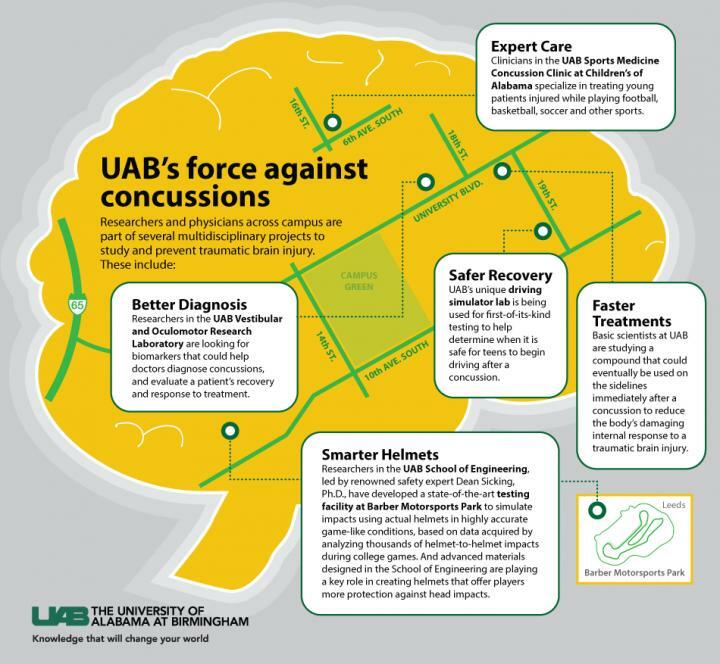 The results of a joint research program from the UAB Sports Medicine Concussion Clinic, UAB’s Vestibular and Oculomotor Research Laboratory, and UABs School of Engineering are being shared with VICIS, a start-up sports equipment company that is reengineering the American football helmet, called ZERO1. The helmet costs a cool $1,500, nearly 10 times the price of an average NFL helmet. But it hasn't been given a thumbs up yet by pro football. They need to test it on the field to see if it really does make a difference in pro play. VICIS launched its first helmet last year with the University of Washington and is continuing to test and perfect the model with new data from UAB. Dean Sicking, UAB’s chief researcher, has worked for three decades on impact reduction in sports and is known for his design of the Safer Barrier guardrails used in NASCAR races. But can a helmet really protect a 200 lb. receiver who’s being hit with 1600 lbs. of G force from a 340 lb. tackle? That’s like getting hit by a car or worse. Still, the technology of new football equipment has helped a little — even as the players have grown in height, weight and speed — by distributing the impact of a tackle across the body. 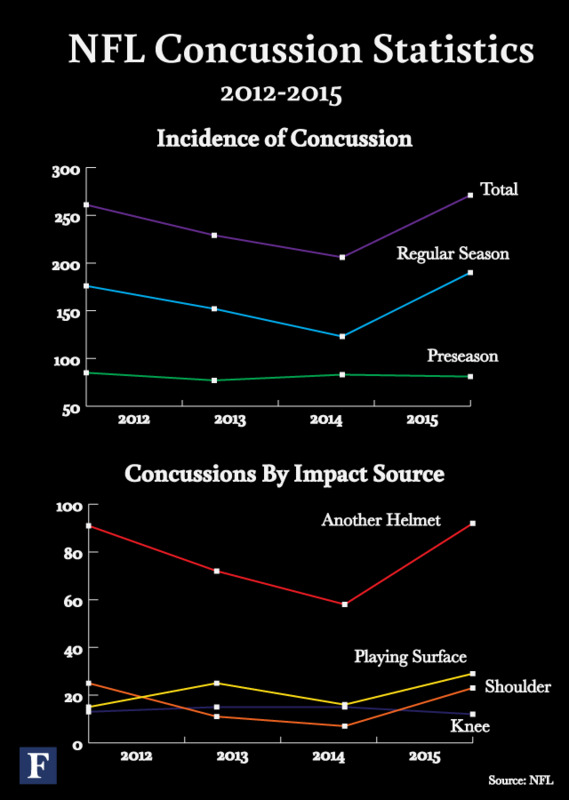 But head injuries are a different problem, and they are inevitable when a player is slammed to the ground (especially when that ground is frozen). Whiplash, shaken baby syndrome — they’re all variants of brain trauma and concussion. Imagine, then, what hundreds of crushing tackles and blocks can do to a player’s brain — even if the player's head was double wrapped in Bubble Pac like a piece of precious antique Tiffany crystal. If the Zero1 can reduce head trauma, it may not only save the brain — it could save the game as well.